Yesterday wasn't my typical working day; it involved eagerly anticipated presents, lunch time tea and Fancie; ideal day, no?! I even started the day looking and feeling fresher than normal; I didn't actually resemble a frizzy-haired, smudged makeup mess for once! Since I've moved home, the commute is really getting to me. It's only an hour from Nottingham to Sheffield and I'm still getting up at 6am as I was doing before, but I'm swapping an hour in the gym for an hour in the car...and an hour back in the evenings. It could be worse and it's only temporary but the days are feeling much longer for me at the moment. Yesterday, was lovely. 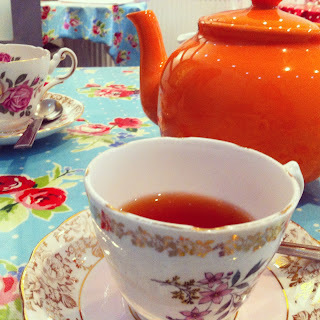 I had work, had my early start but instead of a rapid lunch, I met D at Fancie for a cheeky pot of tea, and I even managed to stick to my healthy eating regime and resisted their delicious cupcakes and traybakes. I genuinely love the Sharrow Vale Road store, it's size makes it quaint and comfortable, like you're sitting in someones beautifully decorated living room. The staff are always super friendly and I never feel rushed to leave, some places do try and hurry you out but never Fancie! I desperately wanted cake, desperately. Yesterdays special looked incredible and I've seen an abundance of posts today to cement into my mind that Mars Bar cupcakes are now back in store. Fancie, whoever does your marketing is brilliant - all I want is a mars bar cupcake! Their presentation is so cute - even down to the table cloth! 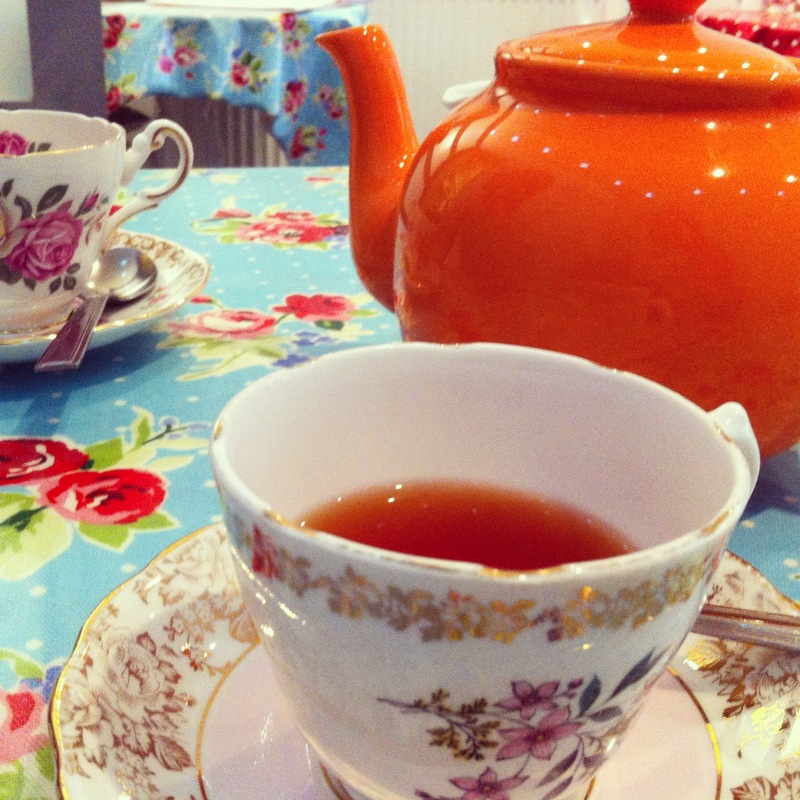 It makes a standard cup of tea even better in a pretty China cup and a bright tea pot. The new Phlegm Pens and Illustrations First Edition Comic. Yaaay! 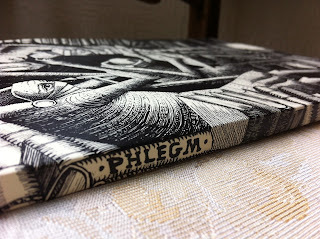 For those of you that don't know, Phlegm is a Sheffield street artist who has such an incredible gift when it comes to his work. His work is normally seen on walls, not just in Sheffield, here there and everywhere. He also produces his own comics and prints every now and again but he runs a one man show so everything is very time consuming. I'm VERY excited to have this new book of his; his art is very unique but I am truly fascinated by the eye for detail he has and just how talented he is. Check his stuff out here. I was lucky enough to have this eye candy in my old apartment for a short space of time too - a lot of effort went in to acquiring the Civilisation print as well! His new book is currently not on sale on his website, but available at The Old Sweet Shop in Sheffield. Snap it up while you can! 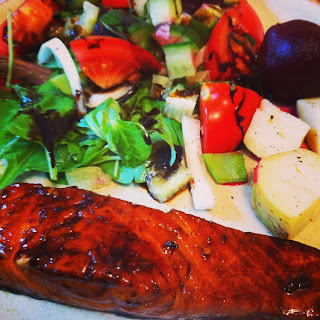 The remaining piece of salmon in Teriyaki marinade with a tasty salad and some new potatoes - I'm not usually a fan of having a similar meal two days in a row but I can never say no to anything marinated in Teriyaki! I know, I know - it might sound like a boring day; nobody really likes having to work but the little things really made this day a not-so-typical working day, mostly thanks to D who not only pleased the inner-spoilt, only child in me and suggested meeting for a cuppa; it was lovely to get out of the office and have half an hour to relax.